A trend of unseasonably cold temperatures and light showers will continue into Tuesday and Wednesday, according to NBC 7 meteorologists. Locals woke up to the gray, gloomy and wintry weather Monday after enjoying a typical picturesque San Diego weekend. "I might have expected it to be a little bit sunnier, but that's OK. Not a problem,” said out-of-towner Bryan Anderson, who was visiting Coronado. 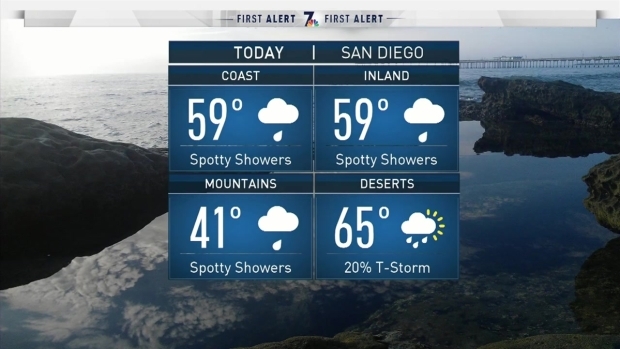 The cool temperatures are being pushed into San Diego County by a low pressure system to the north, NBC 7 Meteorologist Jodi Kodesh said. The storm system did not prompt any weather alerts for the county, but Kodesh said areas could expect to see breezy conditions and a chance of light, scattered showers through Wednesday. The system is "Not a big rainmaker, with the exception of a pop up thunderstorm (and there is a slight chance,)" Kodesh said. The thunderstorms may bring heavy rains but for brief periods of time and in isolated areas. 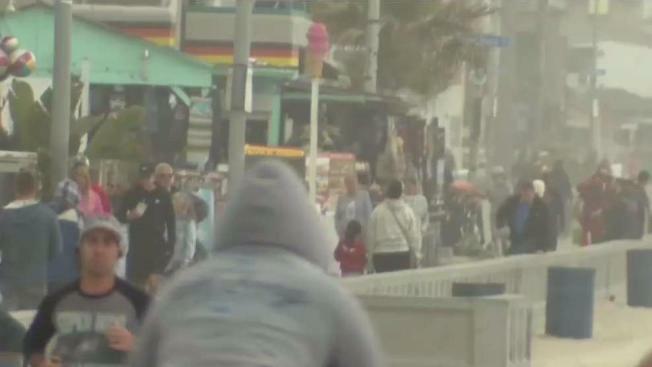 The almost May gray didn’t scare any locals away from San Diego's beaches Monday. "I don't care if it's gray or sunny, it's still fantastic." Pacific Beach resident Marilyn Wilson said. As long as she and her dog can take their daily 2-mile trot along the boardwalk, she’s happy. "What I do is, I have in my trunk enough clothes that I can deal with anything, and I layer." A lot of people at San Diego beaches told NBC 7 they welcome the change because they know at the end of the week it'll be nice and sunny again.